Given the credit union philosophy of “people helping people,” credit union leaders must be driven to provide services for members who expect quick, easy access to all of their payment data. A rising number of credit unions, especially those experiencing loan growth, are taking steps to implement innovative solutions to better serve their tech-savvy members. Those that don’t adapt to today’s technology may find that more convenient alternatives are leading their members astray. Federal Reserve data shows credit unions have experienced steady mortgage growth since 1990. Then the Great Recession happened, and banks around the world collapsed. Some were bailed out. For credit unions, the wake of the Great Recession created a wave of new membership, and the pace of home loan growth among credit unions jettisoned. Loan growth at credit unions hasn’t been limited to home loans. According to a 2017 credit union report by Experian, auto loan originations grew from 1.54 million new accounts in the first quarter of 2015, to 1.93 million in the first quarter of 2017—a 25 percent spike. During the same period, credit unions’ market share of mortgages rose 7 percent. Credit unions’ lending numbers have only gone up since then, thanks in part to new regulations that took effect in January 2017 that extended the capacity for credit unions to make commercial and industrial loans, and commercial real estate loans, to members and non-members alike. These new regulations incentivized more credit unions to accept non-member loans, or indirect loans, from people who want to take out a loan through a credit union while conducting their primary banking elsewhere. Accepting indirect loans can help credit unions, as nonprofits, generate revenue to further support their membership. Many credit unions believe lending is critical to fulfilling their mandate of serving as a source of credit for its membership. With more incentives for credit unions to grow, institutions are expanding membership and loans. The latest trends report from the Credit Union National Association (CUNA) showed total loan balances at above $1 trillion in March. That’s across 5,727 total credit unions in the United States, according to the report. Even as loan balances at credit unions continue to rise, the greater loan market has become more competitive than ever before. The most effective way for credit unions to stay ahead of the competition is through a fintech-solution partnership. Credit unions with a clear, competitive advantage are those relentlessly investigating opportunities to better serve new and existing members. In today’s marketplace, that means offering easy-to-use, cost-effective loan payment technology that enhances relationships with their members. But not all credit unions can afford hiring their own team of engineers to develop user-friendly, leading-edge technology. That’s why, for many credit unions, the fastest and most cost-effective way to implement digital loan payments is by identifying the right fintech solution provider in the market and partnering with them. Not all credit unions can afford to hire an in-house team of software engineers. • It should address the high volumes of loan payments credit unions are handling these days, helping credit unions offer seamless, quick, and effortless loan payments online. • It should improve credit union profitability, meaning it saves the credit union on operational costs but can also become a profit opportunity to give back to their membership. • It should support credit unions’ efforts to continually provide the best experience for their members, improving retention and attracting new members. • It should provide insightful data on loan payment activity, helping credit unions better serve individual members with new products or services. That last point is a critical component for the future of credit unions. By being more detail-oriented with each member, credit unions could create opportunities to strategically serve them on a more personal level. These credit unions could identify exactly what their members need, when they need it—without having to hire an internal technology team to build custom software. Credit unions may have tried implementing other technologies that fell short of what their members demand. There are numerous benefits to a strategic fintech partnership for loan payment processing, so long as the solution provided is flexible, secure, and easy to use. CheckAlt recognizes the challenges credit unions face, which is why we created a white-label solution for loan payment processing called LoanPay. CheckAlt’s LoanPay is helping financial institutions better compete and retain customers in the fast-growing loan market by adding a solution that offers insightful, valuable data. LoanPay provides real-time access to members’ payment history, with the ability to generate reports for internal operations, marketing, and customer service teams. Members can access their data anytime, either from a single sign-on or external link to the LoanPay web portal. CheckAlt's LoanPay solution helps credit union members quickly and easily pay their loans. 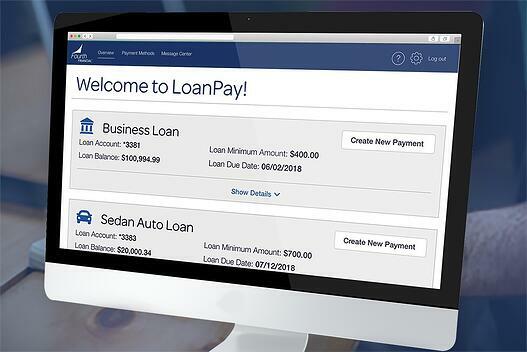 Credit union members using LoanPay have the flexibility to set up loan payments from their credit union account, or pay from a third-party bank, without leaving the web portal. Users can schedule or make one-time payments online anytime, anywhere, to avoid late fees. As a data-driven company, CheckAlt designed its LoanPay solution to allow credit unions and their members access to loan payment information quickly and easily, both online and by phone. Any member can contact a credit union call center to discuss data from their loan account, as call center representatives may be granted access to their entire payment history. 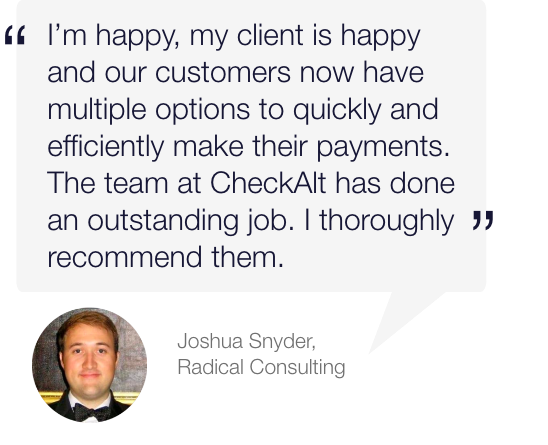 CheckAlt helps guide credit unions through the LoanPay setup process, providing training and 24/7 customer service. Our team is dedicated to providing the best customer service in the business, going the extra mile to ensure total satisfaction with our solution. If your credit union is juggling loan growth without a true, digital loan payment processing solution, we’re here to help. Schedule a demo of CheckAlt’s LoanPay solution.